Being a huge fan of Josephine's Kitchen in Greensboro, my heart broke a little when I heard it was closing earlier this summer. I should have had more faith in owners Chef Chris Blackburn and Sarah Keith, as they re-branded and re-opened as something exceptional: Scrambled Southern Diner. It was a brilliant concept and a strategic move, being that the establishment is surrounded by more divey spots like Hops and Fat Dog's, that UNC-G students flock to. And who doesn't love breakfast? But, who is ever actually able to have it at a restaurant from 6-9am? At Scrambled, you can get it anytime of day (or at least until 3pm.) Like I said, brilliant. At 12 noon on a Friday, my party just had to wait momentarily for a table to get cleared off. Needless to say, business was booming. My eyes feasted on the menu, darting all over the place. Did I want a Waffle with Caramel Sauce? Perhaps Pancakes with Butterscotch Chips? Or the house-made Corned Beef Hash? Maybe The Forester, featuring Brie, Mushrooms and Truffle Oil. I could have even dug into the lunch menu - The Maine Roll would have been quite satisfying. But I stuck with breakfast and I'm so glad I did. I literally played eenie meenie minie whilst perusing the "Scrambles" section of the menu. My server was very patient with me, answering questions about several, as I tried to nail down my decision. 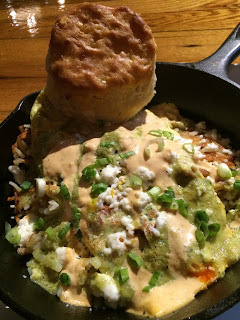 I chose the whimsically named "Green Eggs and Ham" Scramble, which combines a mildly spiced Chorizo, Scallions, Queso Fresco, fresh Salsa Verde, tangy Chili Lime Crema and eggs any way - I chose scrambled - atop your choice of Grits or Shredded Hash Browns (which I opted for), served in a monster-sized skillet. The balance of the savory Chorizo and acid from the salsa and lime crema is perfect. 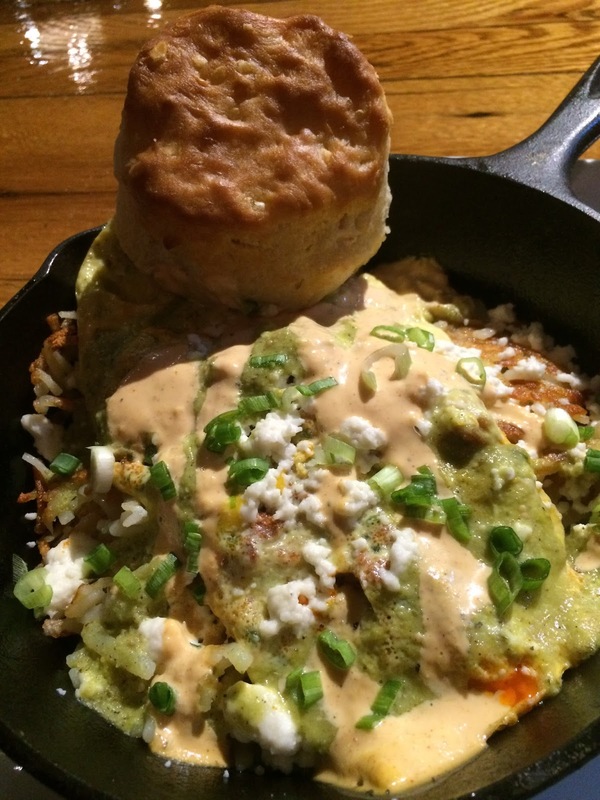 Everything kind of oozes onto the hash browns, which are an ideal base for a dish like this. I loved how the salsa verde even tented the eggs green! I chose a large, fluffy biscuit over toast, and was delighted with it. Care for a swim in this gravy ocean? 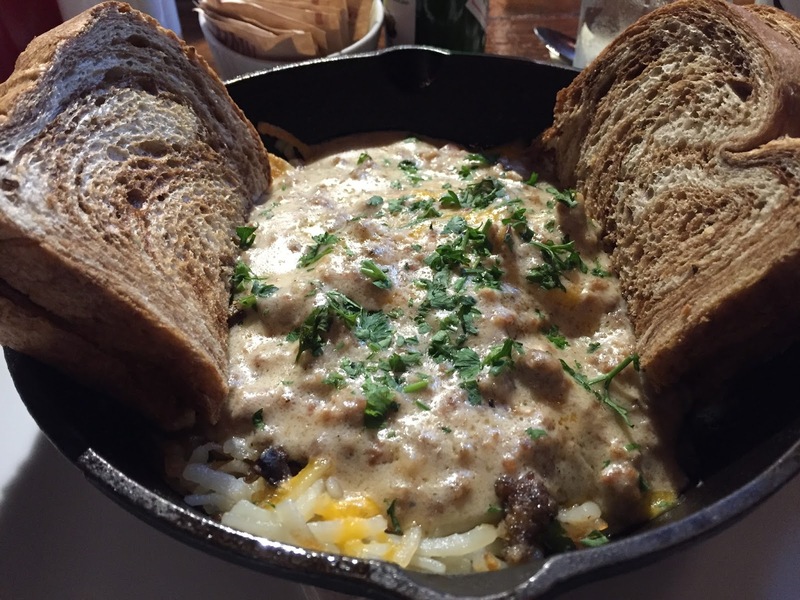 A dining companion chose the "Country Style" Scramble, combining Sausage, Cheddar Cheese, Mushrooms and Sausage Gravy over grits or hash browns. That gravy is sensational. I find that most gravies are too heavily seasoned with sage, or the gravy to sausage ratio is way off - but not this gravy. I was offered a spoonful to taste and it nearly killed me to not dive face first into her dish. Red Eye and Vegetarian Mushroom Gravies are also available, but stick with the original sausage and you will be quite pleased. 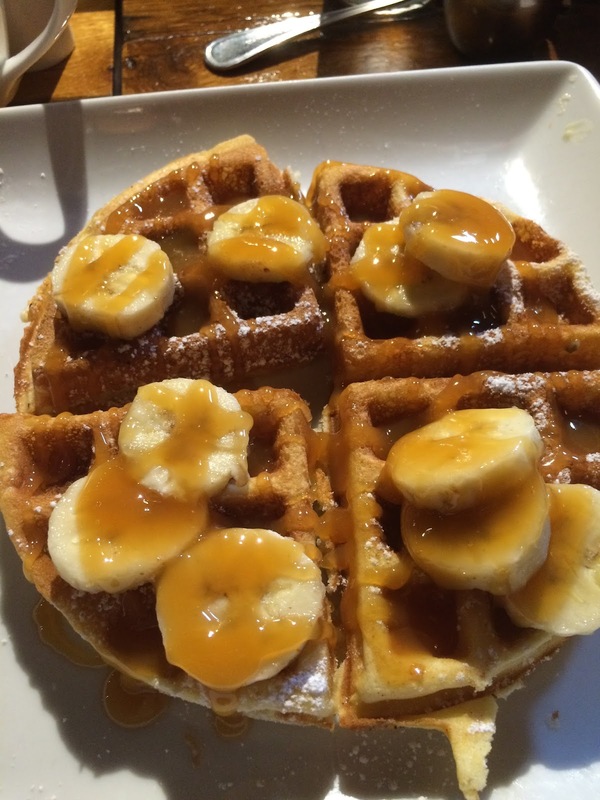 Waffle with Bananas and Caramel! I face several questions when I have brunch. Coffee or cocktails? Bloodies or Mimosas? Sweet or savory? I felt it my responsibility to try something from both departments - I owed it to you, dear readers, to explore both sweet and savory. Scrambled's Waffles err more on the side of Belgian style-thickness, which is more exciting than their flatter counterparts. They're incredibly light and would be tasty on their own, until I looked at the toppings list which included everything from a Banana, Rum and Almond Compote to Apple Butter. I thought house-made Caramel and Bananas would make fabulous toppings, and they did. I can't imagine a better brunch than alternating between bites of savory sausage gravy and chorizo, and these fluffy, caramel-drenched waffles. I'm so excited for Scrambled. It's incredibly accessible for the people and students that frequent that part of town, and Greensboro doesn't have enough places that serve breakfast during the week, all day long. I do look forward to returning on a weekend to explore the Saturday and Sunday only specials!